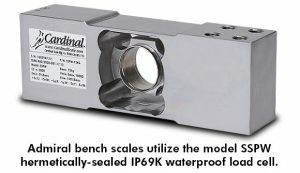 Cardinal Scale Manufacturing Admiral bench scales now feature an IP69K-rated load cell and indicator, so any sensitive electronics are fully protected against close range high-pressure, high-temperature spray downs making them ideal for the food processing industry where equipment must be carefully sanitized. The Admiral’s heavy-duty stainless steel base is built solidly for high-usage durability. The bright, vivid ColorZONE display changes color automatically as pre-assigned target weights are reached for efficient check weighing. In environments that require heavy washdowns, such as in the food processing industry, the combination of water, chemicals, high pressure and high temperature can prove fatal for electronic circuits and instrumentation. The Admiral bench scale’s IP69K rating offers the highest protection rating possible. The Admiral’s colorful 190 STORM indicator is positioned at the optimum viewing height and out of the way of the product being weighed. The display tilt feature allows the display to be positioned just right for each operator. The entire LCD display can be set to any of seven different ColorZONE colors during checkweighing. This exclusive ColorZONE feature takes the guesswork out of the weighing process making the Admiral the top bench scale in the industry. The Admiral’s polycarbonate and ABS enclosure to the weight display is watertight and allows operation in the harshest of environments while the stainless base and column construction ensure long-lasting durability. The scale’s 190 STORM indicator features four captive screws in the back panel, so they cannot be lost when unscrewed (important for food processing applications). Contact the sales team at Central Carolina Scale today. Call (919) 776-7737 or visit centralcarolinascale.com and click the Request a Quote button. According to the USDA, every year the United States wastes an estimated 30 to 40 percent of its food supply. Statista reports that, in 2015, of the USDA estimates, roughly 16 percent of all food waste is attributed to restaurants and foodservice institutions-nearly one-fifth of all wasted volume! This is a huge source of overhead costs, but also a great source of improvement for food service entities to leverage in retaining their hard-earned profits. With food costs rising, waste reduction systems are becoming more important to reduce strain from front-end costs. Waste reduction companies are taking advantage of this need for tracking inventory and getting more accurate weight counts. DETECTO Enterprise series scales, PS portion control scales, and PZ series wireless ingredient scales are all very important tools to aid the fight to increase inventory efficiency, and ultimately, creating increased profits. The accompanying advances in connectivity-Ethernet, Wi-Fi, Bluetooth-create a more streamlined process for saving inventory data and yield a precise representation of a facility’s inventory strengths and weaknesses. DETECTO’s foodservice scales are the first line in establishing a solid reduction program. 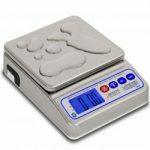 High weight-resolution scales deliver highly precise weights and the associated costs. The ability to audit cooking processes and concomitant prices concretely establishes hard data to analyze. This analysis implementation forms the possible paths to be executed by foodservice management and personnel. Facilities can track reduction areas, foodstuffs to be saved or discarded, and foodstuffs that can be repurposed. Knowing the usage levels of each product determines which products to reduce and where businesses waste capital. Product usage levels can help businesses push certain menu items and discard those that don’t sell well. Businesses can more accurately spot and predict trends in their kitchens in a highly responsive manner. With the power to trend waste areas, kitchens can adjust their cooking implementation, labor cycles, use more efficient recipes, and utilize batch cooking to match customer trends. This knowledge can better serve the needs of their customer base and attract new clientele. The power of an efficient waste reduction system yields amazing results with effort and consistency. Businesses can expect to save significant amounts of front-end revenue, revenue that can be circulated back into other costs and investments. Foodservice businesses large and small can now bolster their earnings and alleviate one of the most costly factors in their respective operations. And it all begins with a weight measurement of the wasted food combined with a digital tracking system for recording that measured waste.